The Cathedral of All Saints stands atop a steep hill above the Hudson River and near the center of the busy capital city of Albany, New York. The first large scale Episcopal church built to serve as a cathedral, All Saints offers to congregants, neighbors and visitors a sacred place of worship and a treasury of architectural beauties. At 320 feet in length and 130 feet at the transepts, the Cathedral is the fifth largest traditional church in America. Designed by Robert Wilson Gibson, and built in the late 19th Century, the Cathedral is in the high Gothic style. Its exterior is clad in warm-hued and durable Potsdam stone. Its interior is graced by stone and wood carvings and by striking stained glass windows designed by Clayton and Bell of London and other notable stained glass designers. 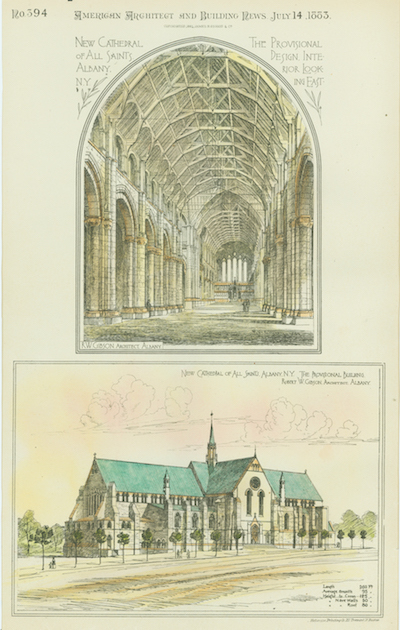 Download a pdf file of the Cathedral's Architectural History written by the principals of the architectural firm responsible for the last major restoration phase at the Cathedral.